Eliza Reads: Desires of the Dead Contest!! I really love this time of the year. Everyone is in a great mood, there’s so much anticipation of things to come, I can just feel the happiness in the air because as we all know… it’s Widget Time! Wait! What did you think I was going to say? 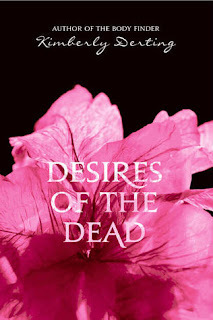 So, do you even know how many days there are until DESIRES OF THE DEAD hits stores??? No!? Well that’s because up until today there hasn’t been a DESIRES OF THE DEAD countdown widget. See? Today is officially the 60 days mark. 60 DAYS!!!! Okay, so here’s the deal…we shouldn’t have to freak out alone. I think we should share this countdown burden, and I’m willing to offer you bribes to convince you of my (evil/genius/slightly deranged) plan. First off, let’s call it a…giveaway, since bribe is such a back-alley word. 3) Earn one extra point for Re-Tweeting/Facebooking (or any other status updating) the contest (but, again, add that point to your running tally!). And that’s not all…because if you act now (I can’t believe I just said that! ), there’s one more way you can earn bonus entries!!! This is the exciting part! Can you *feel* the excitement?? 5) You can earn FIVE extra points just for posting The Body Finder widget on your blog/website/My Space/Facebook/whatever! Five. Extra. Points!!! (And not to beat a dead horse (I can’t believe I just said that either)…but please, for the love of everything that is good and holy, let me know so I can count those points too!) Note: Simply click the "Get Widget" button on the widget in my sidebar to copy the code...if you have trouble, email me and I'll send you the code!!! It’s just that easy. Contest runs through December 31st, so get your entries together and spread the word. And the widget!